St. Petersburg remains Russia’s cultural heart. With its theatrical neoclassic vistas and stray alley cats, baroque palace ensembles and decrepit apartment lobbies, the city has always juxtaposed eerie beauty with heart-piercing melancholy. No longer. Now, with fresh coats of pastels on waterside mansions, restored museums and theaters — to say nothing of the newly cool nightlife and restaurants — the city is playing catch-up to its archrival, Moscow. Visitors go here to soak up the imperial Romanov lore: admire the astounding art at the Hermitage (don’t miss the impressionists on the third floor), catch a ballet at the Mariinsky Theater, take romantic strolls along the stately canals. With a population of more than 4.8 million, St. Petersburg is massive — but luckily, all of the major sights are in the fairly compact historic core. And do make time for a side trip to at least one of the countryside royal palaces. 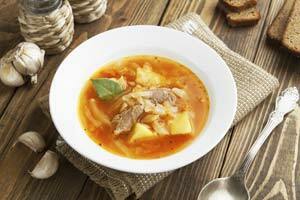 Russian fare, like this meaty cabbage soup, is hearty. Breakfast: Stolle – This minichain of adorable cafes dedicated to babushka-worthy baked treats has a convenient branch on Konyshenniy Lane. Queue up with the regulars for the feathery Slavic pies — with fillings like classic cabbage, delicate fish and rice, tart apples, and lingonberries — then grab a seat in the small dining room decorated with black-and-white photos of Peter the Great’s imperial city. You know you’re in St. Petersburg when you’re surrounded by intellectual types in big wooly sweaters sipping their lattes while reading thick novels. Lunch: Koryushka – Time your lunch at this breezy new hot spot after a visit to the nearby 18th-century Peter and Paul Fortress, where the city was founded. Named after the beloved St. Petersburg smelt fish, the sleek airy space from the mod Ginza Project restaurant group has swoon-inducing views of the city’s iconic landmarks looming across the river. A perfect meal from the sharply executed menu of Russian and Georgian specialties must include a cheese-oozing khachapuri pastry and greaseless, fried koryushka fish with a spicy plum relish. Strong tea with house-made preserves in flavors like quince and white cherry makes an authentic Russian ending. Dinner: Chekhov – This intimate gem on the city’s fashionable Petrograd Side across the Neva River perfectly captures the melancholy-tinged warmth of writer Anton Chekhov’s country estates. In a room set with dark, country antiques, a pianist tinkers Chopin on a white piano while pretty blond waitresses in 19th-century outfits deliver the kind of Slavic fare that makes every Russian reach for the vodka glass. Do have the vodka infused with horseradish or pine kernels with the crunchy house-cured sauerkraut and dill-strewn pickled porcini mushrooms. Then try the shchi (cabbage soup) fortified with pork ribs and served with airy pirozhki (little pies), and the vareniki dumplings filled with tart Nordic cherries. Dessert: Pyshechnaya – St. Petersburg might be awash in tiramisu and French pastries, but nostalgic locals still seek out this endearing sweet spot left over from Soviet days. Old-timers swear that its pyshki — the addictive, slender Russian fried doughnuts — are as good as they were when the city was known as Leningrad. The place gets crowded at peak times, but the sugar-dusted beauties straight from the frying pan are well worth the wait. Just skip the watery coffee. Tip: When strolling the majestic Nevsky Prospect, drop by the landmark art nouveau structure housing the Kupetz Eliseev Food Hall. Dripping with gold leaf and stained glass, the recently restored interior is as impressive as the selection of caviars and smoked fish. The resident French chef makes the city’s best macaroons: Try lemon and raspberry. Can't splurge on a Fabergé egg? Nesting dolls make great souvenirs. For Everyone: Peterhof – The fun starts with the dramatic hydrofoil ride from the steely Neva River up the Gulf of Finland west of the city. The lavish 18th-century palace complex lives up to its moniker “Russian Versailles” with awe-inspiring gilded rooms, extravagant gardens, and fountains. Kids will adore the “trick fountains” that spurt water when you step on a trick stone or touch a particular sculpture. (Bring flip-flops and bathing suits.) Parents, meanwhile, will love the ornate halls inside the Grand Palace, and the Special Treasury in the western wing filled with the czars’ fascinating personal items. Anyone for Catherine the Great’s gowns and favorite snuff boxes? For Couples: Fabergé Museum – You don’t have to be addicted to baubles — or eggs — to be stunned by more than 1,000 glittering objects from the workshop of master jeweler Carl Fabergé. These are now on display at this brand new museum opened inside an 18th-century palace by mega-oligarch Viktor Vekselberg. (He snagged the most precious pieces a decade ago for more than $100 million at a Sotheby’s auction.) Ascend the grand marble staircase to the opulent, silk-walled rooms and gape at the famous “Hen,” the piece that started the imperial Easter egg-giving tradition in 1885. Here too is the exquisite “Coronation,” a pale yellow marvel with a baby carriage inside given by the doomed czar Nicholas II to his wife Alexandra. For now, access is limited, so book through a tour operator well in advance. For Families: Bolshoi Saint-Petersburg State Circus – Russia has a venerable circus tradition, and the 1877 red-domed stone building puts on one of the country’s greatest spectaculars. The acrobats defy gravity, the tigers are enormous and menacing, the elephant is surprisingly graceful, and the bears scoot on bikes. The cute clowns, Valerik and Valik, are so hilarious, no translation is needed. For the Adventurous: Catherine’s Palace – The greatest city escape combines the ice-blue baroque place in the town of Pushkin, 15 miles south of St. Petersburg, with the nearby Pavlovsk, famed for its neoclassic palace surrounded by a gorgeous, overgrown park. The trip is worth it just for the Amber Room at Catherine’s Palace, a majestic chamber decorated with carved oak panels set with six tons of rare amber. After Nazis looted the palace, the entire room vanished mysteriously and took 25 years of work and probably that many million dollars to replicate. Pick up an artful souvenir at the Tsarskoselskaya Amber Workshop run by the artisans who restored the Amber Room. Then toast your purchase with birch bud-infused vodka at the folksy Podvorye Restaurant over a lunch of rich, ruby borscht and plump, yeasty blini. Tip: Even if you have other transportation options, you should descend 300 feet below ground to the St. Petersburg Metro — the world’s deepest subway — to admire the palatial stations decorated with mosaics and sculptures. If time is short, the Avtovo station is the one not to miss. Navigating the city’s logistic and ticket lines — not to mention the language issues — can be daunting. 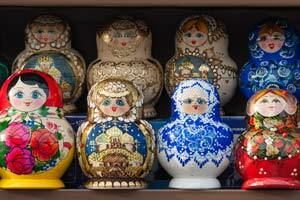 Exeter International, America’s top Russia specialist, will help book your museum visits and palace excursions, and set you up with just the right guide. 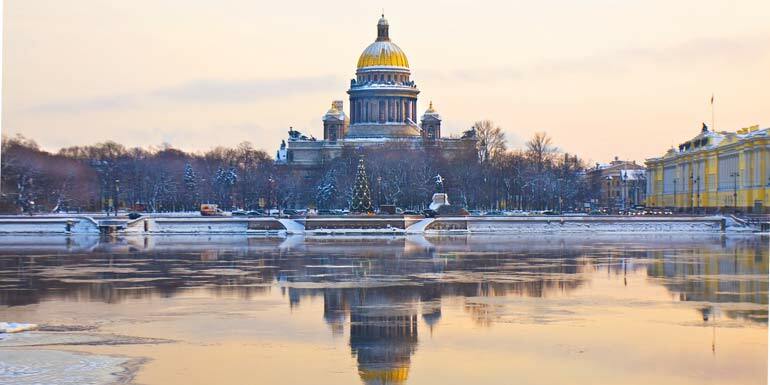 What’s your favorite thing about St. Petersburg?